For higher BC in short, large bore bullets (such as those for 450 Bushmaster, or lead airgun slugs, Corbin makes the PIN-POINT 25-deg. tip inserts. 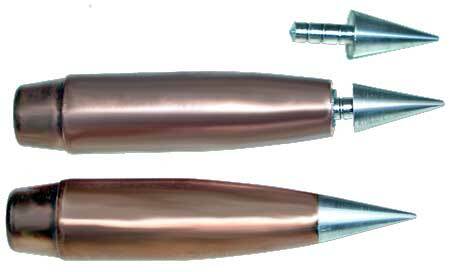 Select PIN-POINT to see information about this design optimized for shorter bullets. You can add the PF-1-HT or PF-1-ST die (which has two ejectors and a base punch included) to ANY other jacketed die set, regardless of the original ogive shape, to add the ULD-TIP design bullet. All the other dies work exactly the same way as with any point forming die. 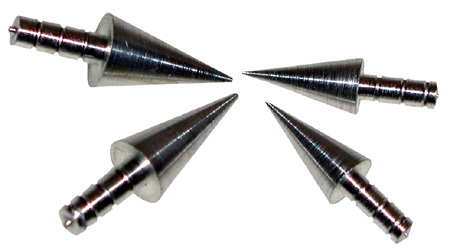 The same style and design of PF-1 die is also used for the shorter PIN-POINT bullets, but the description includes the words "pin-point" instead of "ULD". Otherwise, the operation and die designation is the same. Because the tips are made of CNC-machined metal, rather than plastic, they do not react to powder solvents and lubricants. They will not melt, soften, or deform from being placed under mild stress for a long period of time. There is no "flow-back" of the material from air friction in supersonic flight. Unlike a lead tip, they are much less likely to be bent, dented, blunted, or otherwise deformed during feeding, loading, handling or storage. Being a lower density metal, they help keep the weight shifted back toward the center of the bullet rather than moving the center of gravity further out on the ogive. (If you wish to move the center of gravity at will to any point in the length of the bullet, you can use Corbin's "Bullet Balls", polymer spheres in color-coded diameters which can be placed in the jacket and seated with the core in different sequences and combinations). The PF-1-ST and PF-1-HT tip insertion/point forming dies use a synchronized length, pressure-sealing ejector punch for the first step (forming the ogive with a cavity for the tip stem). The first ejector punch has to hold pressure to allow the lead core to form precisely around the ejection pin tip, making a hollow point cavity just the right diameter and length to secure the grooved stem of the tip insert. The pressure sealing is done by precisely honing the punch and the ejection pin hole in the die. The synchronization is done by matching the length of the punch, and the length of the ejection pin projecting into the die, to the exact depth of the die cavity. This brings the ejection pin major diameter (not including the tip) to the point where the ogive shape ends and the ejection pin hole begins. Making the die cavity involves multiple steps of reaming, diamond lapping, heat treating and more lapping to polish the surface. All of these steps can alter the cavity depth slightly, so that each die will have a slightly different cavity depth when it is finally completed and ready to ship. The ejection pin for step 1 (T-1 punch) needs to be exactly even with the end of the cavity, so it is precisely matched to the die. The sync length numbers are written on the punch and on the die, and are recorded in our records when we ship the original order for the die. If you should order a replacement or spare punch for the first step of point forming, which is the T-1 (tip forming punch number 1), we will need the sync numbers written on the die or punch in order to make sure of a good match. The length is specified to the nearest 0.001 inch. So obviously you can't randomly use the ejector from one die in another die, even if they are the same caliber and the ejectors are the same diameter. If you try, the bullet may have a "pipe" on the end if the ejector is too short, or it may have a flange or thin flashing at the end if the ejector is a bit too long. For the T-2 or the tip forming ejector that has the cavity in the end, the exact length is not so important. It just has to push the bullet out by the tip, and doesn't take part in actually forming any part of the ogive or core while the tip is being seated (other than holding the tip until you get the bullet all the way to the end of the die, where the die walls form the ogive to blend with the tip). Therefore, only the first punch, with the little projection on the end, has sync numbers to match. To understand synchronized ejector punches, select SYNC PUNCHES.